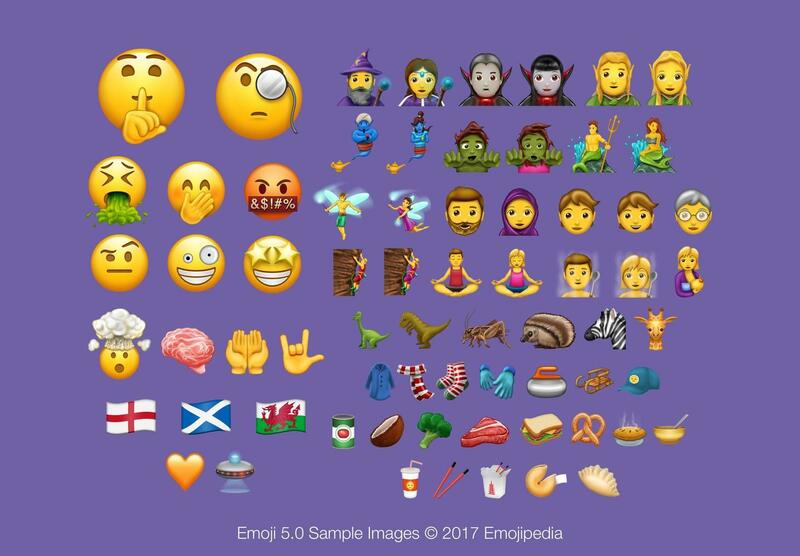 Emoji Wrap 🌯 Bite sized emoji news - 🚨🙌🆕📝 Not a draft: final emoji list is here. Right now. It's here! If you are reading right away, here's some breaking news (🚨): Unicode released the final emoji list for 2017 just 15 minutes ago. The final list of new emojis totals 239 entries when skin tones and genders are taken into account. Zombies have skin tones; Genies have gender; Pies are delicious. Plus a giraffe; and more. View the final emoji list now, along with our sample image collection showing every emoji approved (minus the skin tone variations!). Huge thanks to Joshua Jones who has designed every emoji in our sample image collection over the years. Everything you might want to know about this update. You might like this video we put together showing off the new emoji list in high resolution, with images from our Sample Image Collection. Unicode's announcement about Emoji 5.0. Japan continues to lead the way in signage. Facebook's reaction feature is a fascinating glimpse into a simple form of sentiment analysis, and what can be done with it. Jonathan New digs into the impossible task of counting the length of an emoji, and emoji sequences. 📜 Is this the world’s oldest emoji? "In 1635, Jan Ladislaides relayed his approval of a document with the tiny face, and its discovery makes it the world’s oldest known emoji." With the release of Emoji 5.0, a Texan flag emoji will be a valid sequence for vendors to now support, if they wish. "Side-eye reaches its full potential in the opaque language of Snapchat friend badges, where it symbolizes a one-way relationship"
Justin Bai started off trying to find who was on Apple's contact card emoji, and found further claims about who actually designed Apple's first emoji font. Úll is a conference for people who build and love great products. Being held once again in the beautiful setting of Killarney in Ireland, 2017 features special guests Christina Warren, Horace Dediu, Jason Snell, and more. I'll also be speaking at this event; and as an attendee in past years I can say I genuinely have found this one of the best run conferences I have been to. Emoji Wrap subscribers can get 10% off by using this link or the code EMOJI10 if booking by March 30, 2017. This email is about 100 people short of hitting 10,000 subscribers. I wanted to make this a special one, and thought you'd appreciate being first to know of the final emoji list for this year. Comments? Find me on Twitter @jeremyburge or the page for this newsletter and associated podcast is at @EmojiWrap!